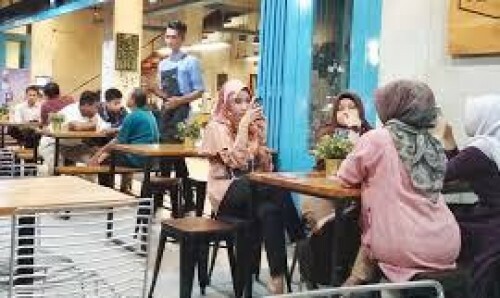 Jakarta : A regency in the conservative Indonesian province of Aceh, where Islamic or sharia law is applied, has issued a ban on unmarried couples sharing the same table unless accompanied by family members. The new law adopted in Bireuen also prohibits attending to homosexuals and serving women from 9 p.m, human rights activists said on Thursday, Efe news reported. According to the law signed by the mayor, Saifannur, the time limit for women may be ignored if accompanied by a relative. Article 10 of the regulation, approved on August 30, bans establishments from serving customers who violate sharia law, such as LGBT (lesbian, gay, bisexual or transgender) clients. Article 13 underlined that it was "haram" or prohibited, for men and women to eat at the same table unless accompanied by a relative. Aceh, located in the north Sumatra island, is the only Indonesian province to be governed by sharia law. Actress and founder of non-profit Suara Hati Perempuan, Nova Eliza, joined the criticism from activists and local business people. Eliza sent a letter to the city councillor on the grounds that the regulation interprets sharia law incorrectly. She told Efe news that the regulations limited the freedom of working women and were detrimental to not just women but also businesses. Aceh first introduced sharia law under a concession made by the central government to persuade it to abandon its aspirations for independence and to end clashes. Sharia law in Aceh criminalizes homosexual relations, adultery, gambling and alcohol consumption, with caning a common form of punishment. Indonesia is home to the world's largest Muslim population, with nearly 88 per cent of its over 260 million inhabitants devoted to Islam, who mostly practice a moderate form of the religion.